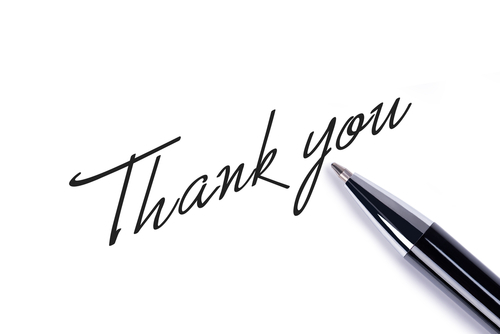 The Power of the written "Thank You"
One of the sacrifices that has been made on the alter of the convenience of the internet is the power of a handwritten note. The ease by which we can immediately communicate our thoughts via email, phone texts and social media ( Facebook, Twitter, Instagram) makes it seem cumbersome and too time consuming for us to actually take out pen and paper and write. Sarah Kaye Kantos expressed the same thoughts in an Elite Daily article entitled The Power of the Pen. She writes "We can let people know what we’re up to in 140 characters or less as soon as we hit 'Tweet,' update our friends about life through our Facebook statuses or shared photos and send a message to whomever we desire, just by pressing a few buttons on our cell phones. We’ve grown so accustomed to relying on the quickest and most convenient ways possible to get in touch with one another that the practice of taking the time to handwrite a note or letter is rarely a thought that comes to mind. Writing to people doesn’t only let them know you care or you’re thinking of them; letters also let people know they play important roles in your life and taking time out of your day to write to them was something you cared enough to do.There’s a certain joy and excitement that comes with receiving an envelope in the mail with your name on it." One of the purposes of Adopt-A-Cop is to encourage prayer partners to take the time to send a handwritten note to an individual law enforcement officer. The note doesn't have to be long or eloquent, and it doesn't necessarily even need to be original. A simple "thank you" for your service along with a scripture reference can communicate volumes to the recipient. To help make this happen, we have created some custom cards that are available to purchase through the Adopt-A-Cop website. If you are still wondering as to whether or not receiving a handwritten note makes an impact on a law enforcement office, watch this video. Go ahead... write a note today!